Tis the season to be jolly, and it’s always jolly to be given a home-made foodie present, isn’t it? 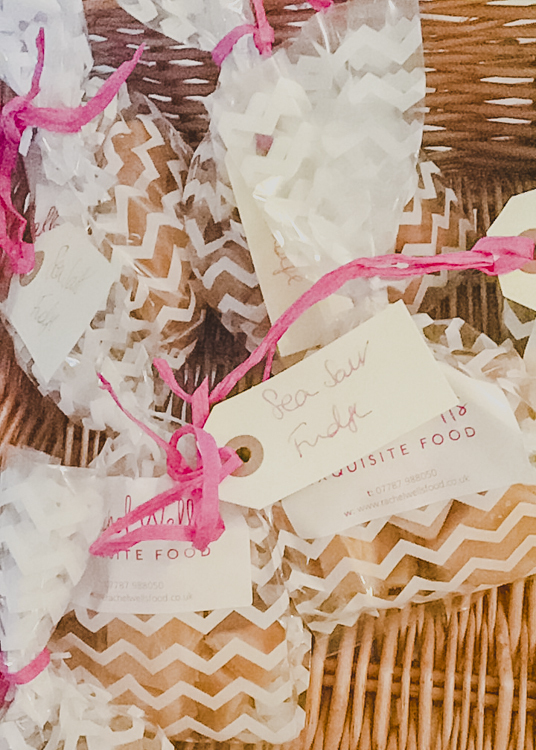 Little bags of sweet treats and cute little bottles of flavoured vodka make ideal gifts for teachers, neighbours and anyone else you think deserves showering with a little seasonal love. I’ve been making my Sea Salt Fudge which I have shamelessly plaguerised from the Nigella website. It does demand a lot of sugar and a lot of attention but other than that, it couldn’t be easier for fabulous results. Don’t stint with the beating, this really gives it the texture you’re after – more like Scottish tablet than soft fudge. Fill a small bowl or jug with ice cold water and put near the stove. Grease a tin of approx. 30 x 20cm/12 x 8 inch or 25cm/10 inch square, or use a throwaway foil tin. Put all the ingredients, apart from the vanilla, into a large, heavy bottomed pan and bring to the boil, stirring constantly. Boil for 12-20 minutes, still stirring all the time, until the mixture is golden and, when a bit is dropped into the water, it turns solid but still squidgy, i.e., till soft-ball stage. How long this takes depends on how ferociously it bubbles as well as on the properties and dimensions of the pan. This is hot work! When the fudge is at soft-ball stage, very carefully remove the pan from the stove and stir in the vanilla. Preferably using an electric whisk beat for about five minutes, by which time the fudge will have thickened to the texture of stiff peanut butter - this is quite steamy and strenuous - and pour and push into the prepared tin. Smooth the top as well as you can. Put in the fridge to cool, but don't keep it there for more than 2 hours, or it will set too hard, then remove and using a sharp knife, cut into squares. Also on the agenda this Christmas will be Toffee Vodka. You wouldn’t believe how easy this is to make, and with the help of your dishwasher, yes you read that correctly, it’s ready in no time at all. No need to let it sit in a cupboard for a month – hurrah! Empty half the vodka into a clean empty bottle. Put one bag of each toffee, one hard and one soft, into each half bottle of vodka. This will slowly dissolve over a week or so but if you’re short of time, this can actually be achieved in a humble dishwasher! Just make sure the bottle is well sealed, don’t use any detergent and put it on a hot wash! With a little innovative wrapping, these really do make gorgeous presents for anyone. You can stock up on pretty ribbons, twine, labels and bags from places like Lakeland, Dotcomgiftshop and Drinkstuff. If you’ve got time to make a few batches of these recipes, then you’ll have a decent stash of gifts ready to hand out – it really is worth the effort! 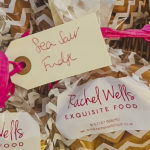 Please enter your email address below to get the latest posts from Rachels Wells Food. Private cook to the most discerning of clients, Rachel will grace your occasion with exceptional food, creative presentation and effortless elegance. For fabulous food and wonderful service in London, Oxfordshire or the Cotswolds, call Rachel now on 07787 988050.